I discovered the young Swiss artist Felix Baudenbacher through my great friend, the New York photographer Don Freeman. Come with me to meet Felix whose life would make the basis for a lovely novel. DDS: You have had a peripatetic, international life. FB: Bio: I was born in Switzerland on April 24. 1977, sharing my birthday with Willem de Kooning, a fact I try to find mythical meaning in during times of low self-confidence. After a year and a half in Gabon, equatorial Africa, where our father worked at the Albert Schweitzer hospital, we settled in the canton of Appenzell in Northeastern Switzerland. I spent an exchange year in Bel Air, MD. DDS: Where did you study art? FB: I emigrated to London in 1998 to study at Central Saint Martins College of Art & Design, graduating with a BA Fine Art (Painting) in 2002. I won some prizes and thought that now my career as a fine artist had started. Nothing at all happened. I sold tickets at the National Gallery before moving on to an administrative assistant position there (neither of them life-altering experiences but walking through the empty galleries of the National Gallery in London every weekday morning on the way to the office is a pretty special thing for a painter). I had a tiny studio in East London and was painting in the evenings and on weekends, participating in a few group shows here and there. DDS: You had the good fortune to leave London for Los Angeles. FB: In 2004, I moved to Los Angeles, where I worked as a runner on films and commercials for a few months before meeting Scott Flax, a well-respected decorative painter and architectural colorist, who was just then looking for a new assistant. I worked on some interesting projects with him, learned a lot about color and found out that the decorative painting world wasn’t for me. 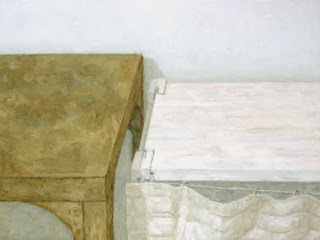 I had my first solo show in October 2007 at the Found Gallery in Silverlake, Los Angeles. DDS: Switzerland and family called? FB: At the end of 2007, I moved back to Switzerland. I had come to love L.A. but after a divorce in 2005 (I had gotten married to an American in England), there wasn’t any real reason for me to stay in the US. Besides, I missed my family. 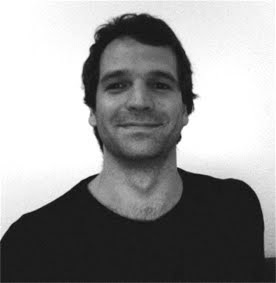 I moved to Basel, where I quickly found work as an English and German teacher at a private language school. I also fell very deeply in love. I was soon able to limit my teaching to 3 days a week, finally giving me ‘real’ time to paint. These elements of time, space, financial and emotional stability allow me to pursue a career as an artist in earnest now. I’m looking for high-quality galleries anywhere to represent me. 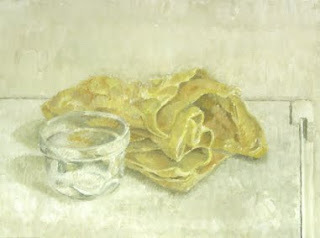 DDS: How did you start experimenting with paintings of tabletop still lifes? FB: Back in art school I was assigned a new painting tutor for my final year. In our very first tutorial he said: “I’ve looked at what you did last year and I can tell you’re very sincere in your work. 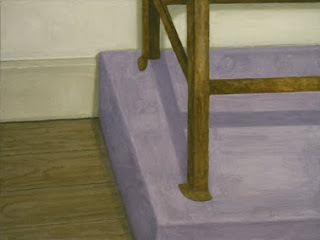 Unfortunately, you don’t understand the first thing about painting so let’s start again at the beginning”. It wasn’t what I would call a classical education, but I learned from him about a painting’s interior life and laws, about the strange fact that you kill a painting when you just copy nature as faithfully as you possibly can, that you have to make it work as a painting first and foremost, even if it’s worked from life — I think Cezanne called a painting a reality parallel to nature, or something like that. 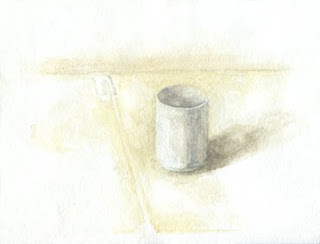 I was learning about all that by drawing and painting objects set up on a flat surface in my studio. My degree show consisted exclusively of still lives in various degrees of recognizability and formats. 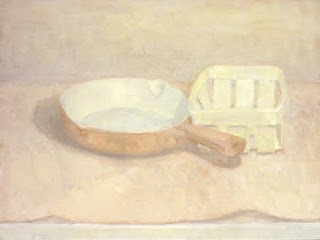 I was very much inspired by Giacometti’s paintings back then so many of my still lives had a similar feel to his. DDS: The life of an artist is not always a dream. FB: What followed were a couple of frustrating years of hitting my head against the same few walls, artistically speaking, until I decided to stop doing that and avoid the whole problem of figuration by fleeing into abstraction. FB: Fast forward six years to the summer of 2008. I had just moved back to my native Switzerland from Los Angeles, where I’d had my first solo show, consisting mostly of grid-based abstract paintings all about California light. I settled in Basel, had a small studio but paint what? Abstraction had never fully satisfied me and I had long suspected that I couldn’t avoid the problems of figuration forever, and that I would have to go back to dealing with them sometime. I had come full circle and was as lost as I was at the end of my second year at art school. And I did the same I had done back then — I set up a few objects on a flat surface and started painting them. Except, this time, it wasn’t about learning about painting but about trying to forget all about it. Whatever was going to happen would happen between the objects, the canvas and me. I was determined not to let art historical thinking discourage me like it had so often in the past. So what if painting was dead, if what I was doing was anachronistic and obsolete in the 21st century and if every artist of my generation I knew was into ‘street’ and post-modern conceptualism or painting fantastical narratives and interior landscapes? My only guiding criterion would be whether it worked and felt ‘true’ to me. Of course, it wasn’t anywhere as dramatic as I’m making it sound — no-one can work in a vacuum and I was going back to Cezanne and looking at a lot of Morandi; but I was trying to give myself as much freedom as possible. The first attempts were discouraging but I soon found the beginnings of something, a new honesty and simplicity. I’ve been following that since then. DDS: I love the classic muted colors and subtlety of your interiors. FB: I’d love to say that’s all intentional and quote my sources of inspiration, but, honestly, it’s much more the result of my limited abilities than anything else - working with muted colors is a lot more forgiving than working with bright colors. Not coincidentally, my work is getting more colorful as I’m getting more comfortable with this way of working. Don’t get me wrong, I love the subtle work, it’s just not totally intentional. DDS: You capture a wonderful mood of natural light. Is your inspiration a particular place and time? FB: Quite the contrary, actually. Because I have irregular painting hours due to my teaching activity, I work with closed shutters in artificial light to keep the lighting conditions consistent. I love it, of course, if the paintings evoke natural light. Now that I think about it, I do take the paintings down into our apartment (my studio is on the floor above) in the final stages to judge them in daylight and make decisions away from the actual objects depicted — in that sense, the simple but beautiful apartment my partner and I share — our home — is my place of inspiration. 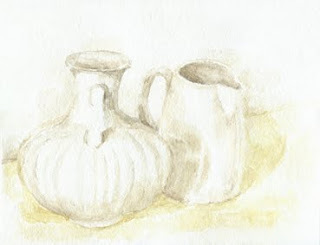 DDS: You work brilliantly in various media—oil, watercolors. And you maintain the same delicate palette and exquisite emotion in all of them. FB: I think that this is the area where my abstract work turned out to be a lot more than just avoidance of problems in figuration. It taught me a lot about color and about restricting my palette. As for the emotion in them, that undoubtedly comes from a stable and happy personal life, grounded in a great love. That shows in the work. DDS: You work in oil and watercolor. FB: Struggling with oils, I avoided watercolors for all these years, considering it too difficult a medium, mostly because my way of working in oils depends on being able to endlessly add and subtract until I get just the right balance, whereas with watercolors, you have to get things ‘right’ from the beginning. Also, the medium is very unforgiving — heavenly when gotten right but so bad when gotten wrong — and it’s so easy to get wrong! 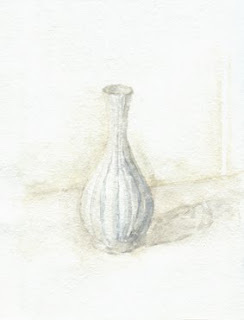 With growing confidence due to the oil paintings going quite well, I found the courage to do my first watercolor about 10 months ago - and found to my surprise that it suited me. 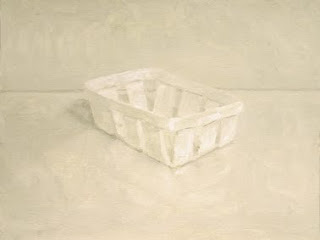 I found a way of working with it that also allows me to ‘take away’ paint — at least to some degree. At the same time, the limitations imposed by the medium give my watercolors a spontaneity and freshness my oil paintings sometimes lack (I tend to overwork pieces). DDS: I was so happy to know that you work with Sennelier pigments. I buy them in Paris at the Sennelier shop at 3, quai Voltaire. Their natural colors and textures, and the delicate blues and greens are especially complex, subtle, and elegant. FB: I use Sennelier oil paints. Being a beginner, I bought myself just a basic watercolor set. I do love the Sennelier oil paints, though - their color is exquisite in its depth and richness and I prefer the way they handle to the other top-of-the-range oil paints I have experience with, Rembrandt (by Royal Talens) and Old Holland paints. 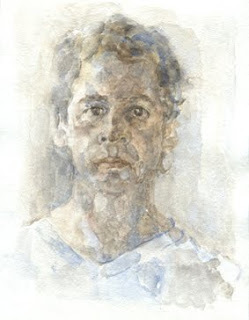 DDS: Your portraits are very tender — but somehow the subjects are confronting the viewer rather directly. They are a little disconcerting in their directness. FB: Working from life is central to what I’m trying to do. I want to show things, not explain them or tell a story about them. Any ‘pose’ of the sitter (which, so far, have only been myself and my partner) invites interpretation and narrative — that gets in the way of just showing. There is simply no reason to paint them in any other way than fully head-on. I understand that that can be a little disconcerting. After all, we don’t enjoy people intensely staring at us in real life, either. DDS: What new topics and subjects are you exploring? 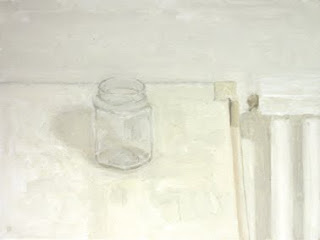 FB: I’m still doing still lives but have recently gotten into the idea of painting ‘non-paintings’ — what I mean by that are still-lives without the objects of the still life, i.e. the empty table I usually set up still-lives on, the piece of builders’ foam I found on the street and used to raise the level of the still-life table, the various baskets and boxes I use to keep materials and still life-objects in but without the objects or materials in them. I’m also hesitantly experimenting with somewhat larger formats. That’s tricky because I can’t just paint the objects larger (that just makes no sense to me), which means more objects have to be painted on a larger canvas and then it becomes more of a ‘composition’ again, more ‘artsy’ and complicated — all things I want to avoid. 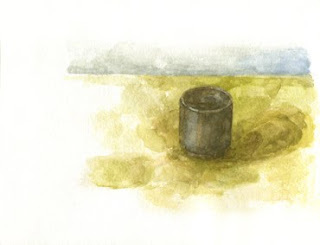 I want to try larger watercolors, though — so far, they’ve all been just of one or two objects, with not much more than a suggestion of a surface they sit on and of a wall behind them. I’d like to try to bring them up to the size of the small oil paintings and paint more fully articulated environments. I want to paint more portraits but I’m sick of my own face and my partner is very busy these days so that’ll have to wait — I don’t have the courage, yet, to ask anyone else. Felix Baudenbacher can be reached at felixbaudenbacher@hotmail.com. All paintings above are by Swiss artist, Felix Baudenbacher. Fascinating portrait of the artist-I am sending this on to my niece,et al. I find the young's desire to find meaning and purpose in life admirable, & as most artists do-take all opportunities & consider life a canvas. His work is beautiful. 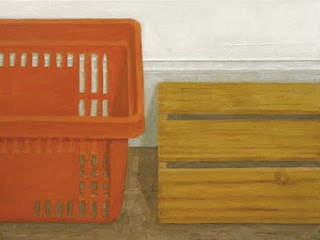 How artistic he paints the simple, mundane household objects-especially the laundry basket. The portrait is really the finest. DDS as model? I like it. Nicely done Felix, enjoyed the Q + A, as well as the art, good luck on your show later this month. This is so beautiful to read and to see the progression, growth of a man both as a person and an artist..Felix, I am very proud and very inspired by your example and really LOVE your new work...It is very clear that you are becoming very present for the moment through which your perception has sharpened and your expression have softened in the process..Looking at your work I can feel the peace and meditation in which you spend your hours and days, and that I believe is the highest achievement for a man..
And of course thanks to Diane for the wonderful portrait and interview. 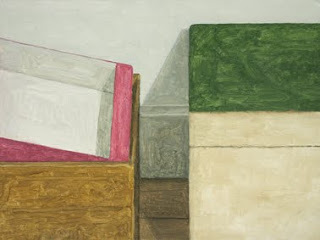 His work has echoes of the masterful Giorgio Morandi. another beautiful and thoughtful educational post. I LOVE his art. And you ask all the right questions to bring out the soul of the artist. Yes, they do have a Morandi/simple/elegant vibe. I find Felix's more delicate and more involved with the everyday. 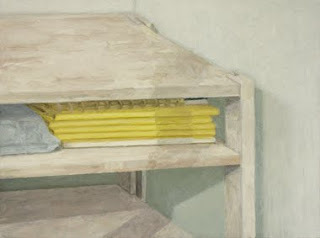 The last piece of Morandi I saw, at the Peggy Guggenheim Museum in Paris, looked more monumental. Thanks for your insight--I agree with you. Love your comment, thank you. I knew you'd like these--so poetic and lovely. Thank you. His words will be a great inspiration to many aspiring artists. Creating art is also about living a life of an artist, daring to paint, being bold and brave for there is much to date. Daniel: Yes, you are precisely correct. I agree...and realised I had not added dimensions and exact materials. I've send an email to Felix and will send the information through for you and for all. You make a fine point. I love hearing from brave and bold readers around the world! measurement from 10 7/16 x 8 7/8 inches (smallest watercolor) to 15 3/4 x 11 13/16 inches (all the oil paintings). example, measure 11 1/4 inches x 8 7/8 inches. Baudenbacher's small masterpieces offer a meditate calm and a quiet insight into the beauty in the everyday. They are priced from 500 dollars for watercolors and 2200 dollars for oil paintings, through the artist. I love your site and this is such an interesting insight into Baudenbacher's art. Very soft and soothing, almost ethereal. 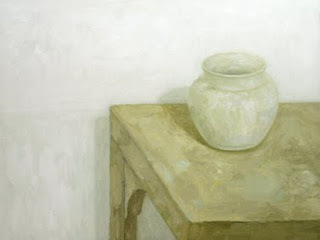 I agree with the Morandi comment too; there is simplicity and sensitivity. I find them beautiful. Thank you.